Sack specializes in making the game type, platformer, so I wondered if this could be another brilliant game from him. And I would probably say this is his best game yet, with loads of enemies, hazards and puzzles this game is not only hard, but fun as well. Because of this, Dead Screams is extremely addicting. Dead Screams isn't a guessing game, its a logical game. There are also little gaps in the floor, so you have to be cautious when attempting to find the crystals. To start off you have a choice to make, right or left? Once you have made that choice, you have to go up two floors via two ladders. Next you will meet one of the many enemies in this game (they are all mutants). 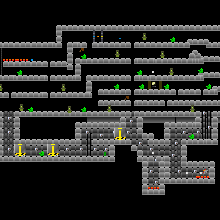 Then you will have to fall all the way to the underground where you meet 3 crushers (they should be as easy as pie). This is only one way of starting the game off, there are lots more ways to play this game (thats why i love it so much). I will stop there because Sack has gone through a lot of effort to make this game and I am not going to revel all of his games secrets. Dead screams is a game where you have to devise your own way to get the crystals in the fastest possible time. You could go as far as to say this could be classified as a maze. Some of this game you can actually cheat to give you a better time, which, I am sorry to say, is a design flaw from Sack. But as far as I know of this is the only one. Sack obviously took a long time on this because even the parts of the game you don't have to use to win are littered with traps, which tells us that Sack is not satisfied with a good game, he wants a brilliant game. All of this games ingredients were thought out before being put into this game, thats why i like this game so much. Dead Screams is a very unique and clever game because of its layout. Also this is the kind of game where some people will get bored and some people will keep coming back for more. One thing letting this game down though is that is dose not have a plot, which for some people is a big problem. I also loved the look because it looked very professional with the statues, grass and (when underground) walls. The game wasn't impossible (by a mile). What I am trying to say is that Dead Screams is a brilliant game full stop.